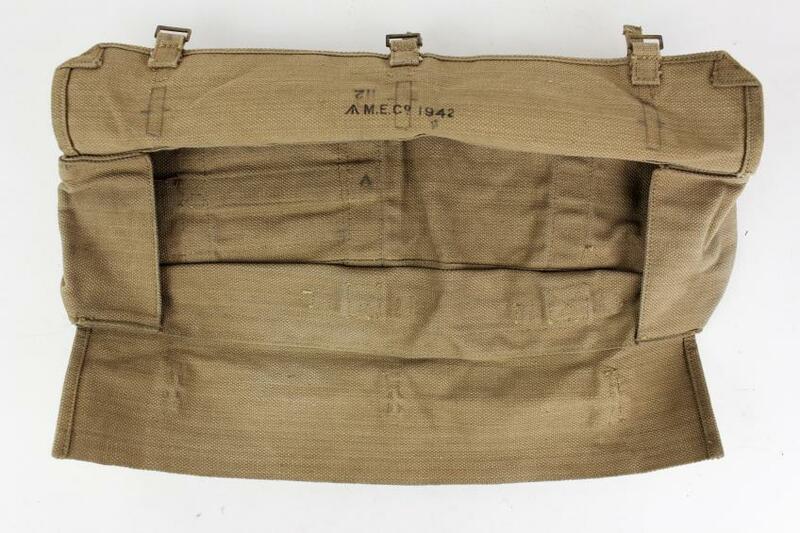 Airborne forces leg bag for the carriage of four 2in mortar bombs. 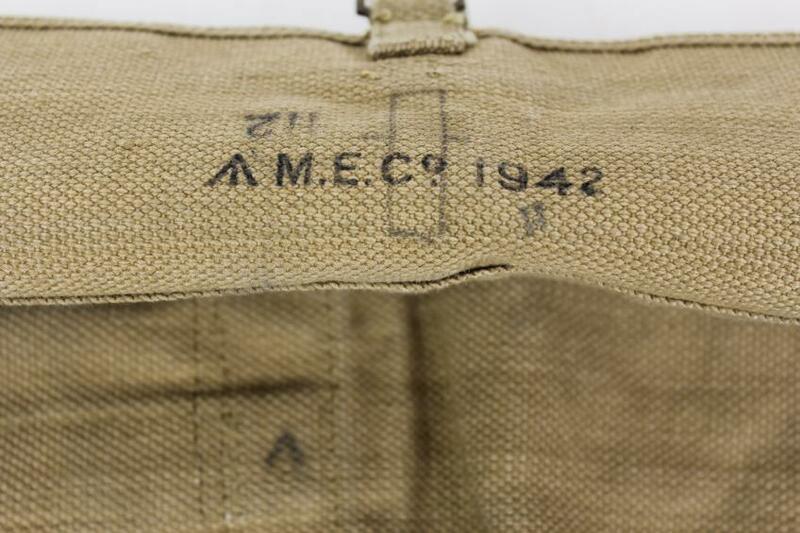 'MECo' marked & dated 1942. 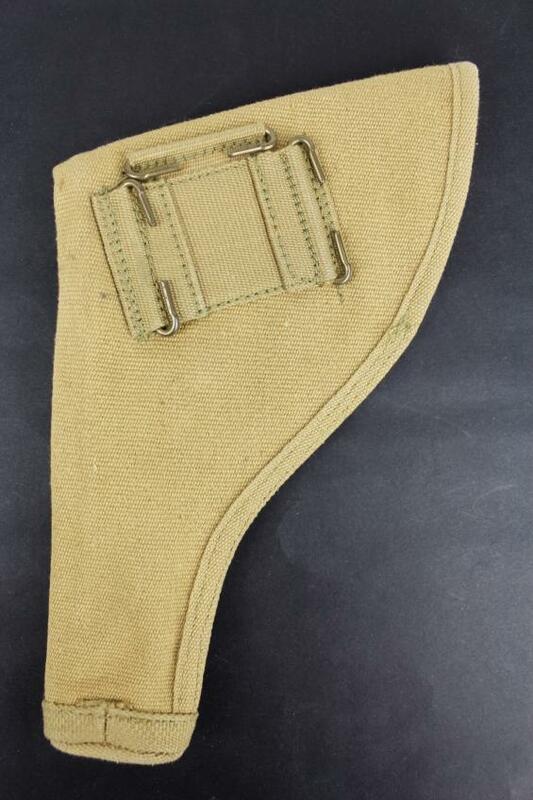 Designed with quick release fasteners in webbing canvas this example is in excellent condition. 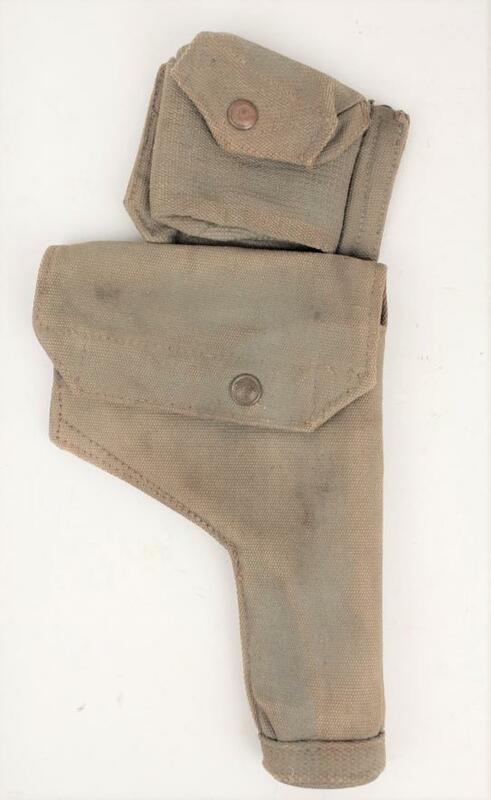 A British 1937 pattern pistol holster dated 1942 complete with the 1940 dated pistol ammunition pouch that was found still on it. 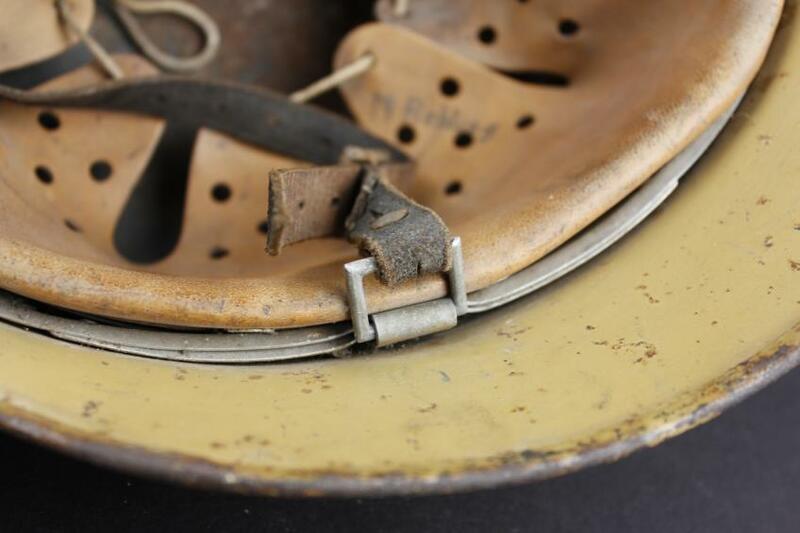 Both items are matching in age , condition & colour with what appears to be the remains of a faint blue blanco finish to the webbing. 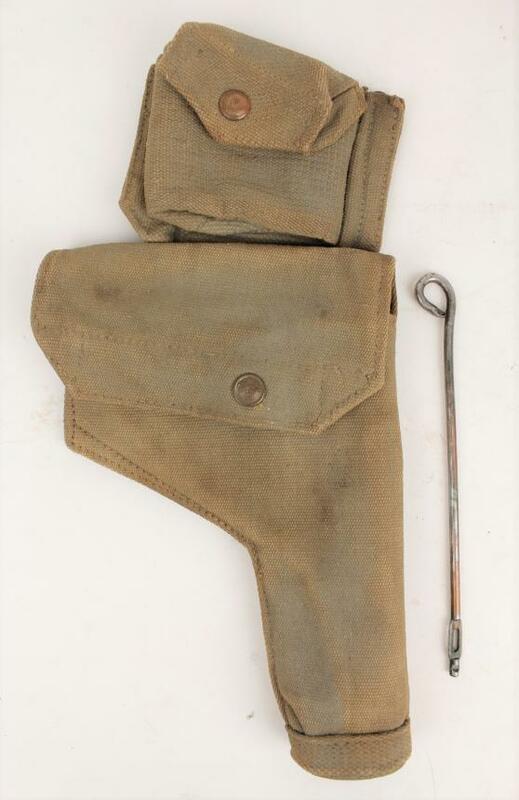 The markings of the holster are crossed out however the date of 1942 is still discernible & also a crossed out name with the French rank of 'Caporal' just about visible. . A steel cleaning rod came with the holster & is included with it. 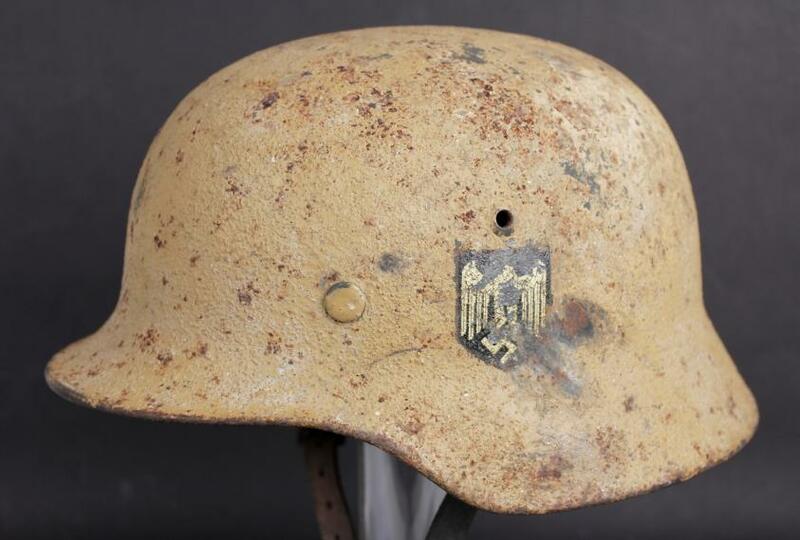 A superb example of the Indian made GS with 'ZSS1944' markings & Indian broad arrow inspection marks. 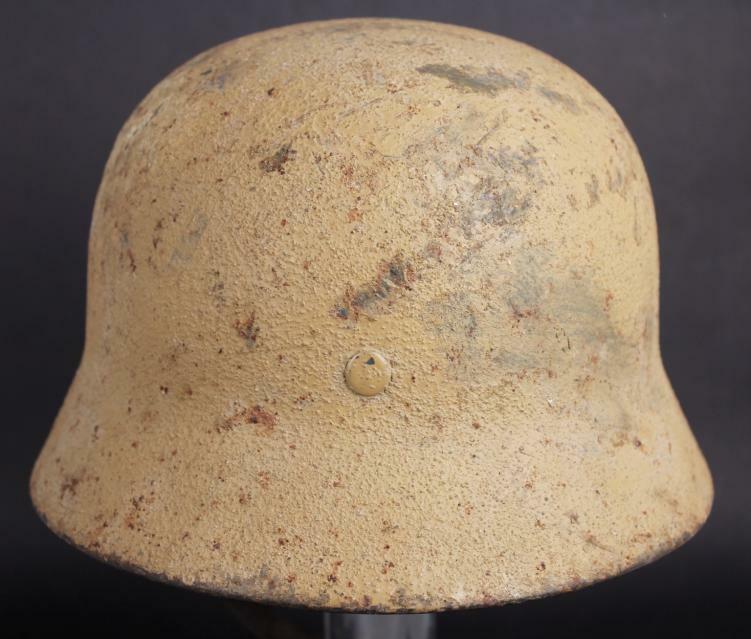 A quite fantastic helmet that I have recently had the good fortune to come across being a rare desert camouflage M35 single decal army helmet from Hitlers Afrikakorps. 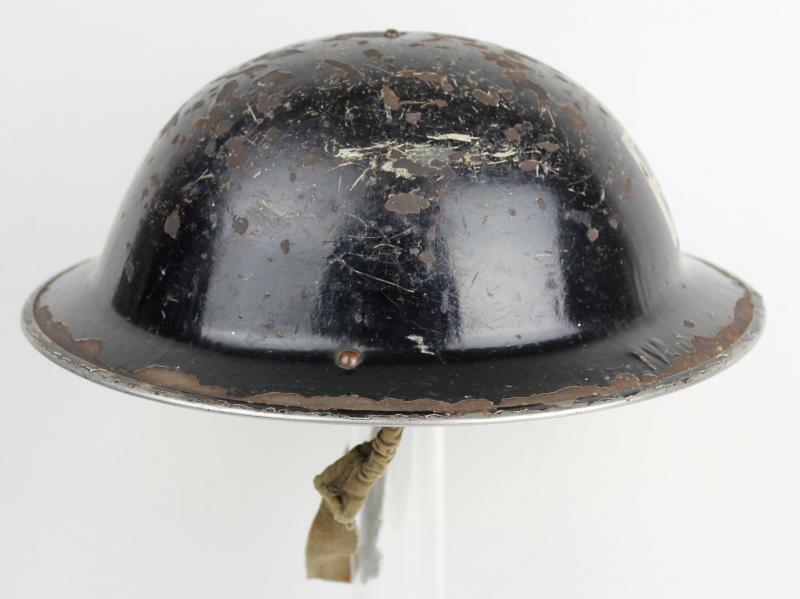 This helmet was the souvenir of a British soldier & as such travelled straight from the battlefield back to England then into private family hands until now. 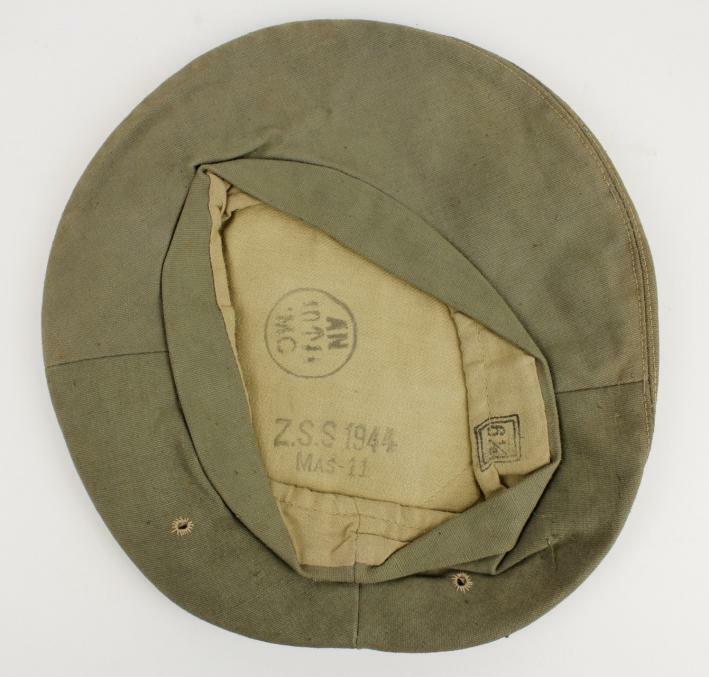 An M35 helmet that has clearly seen much Desert service it was brought up to M40 specifications by the covering of the national shield & the army decal to its left side being painted around. 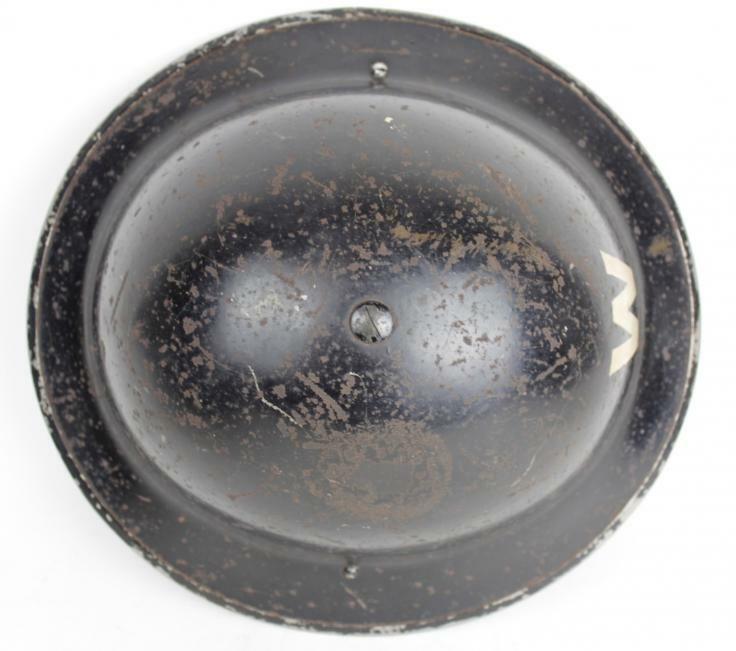 This being an 'SE' produced helmet , the decal is most likely the same as that found on 'ET' helmets & is typical with slightly darker detail lines compared to those found on other helmets. 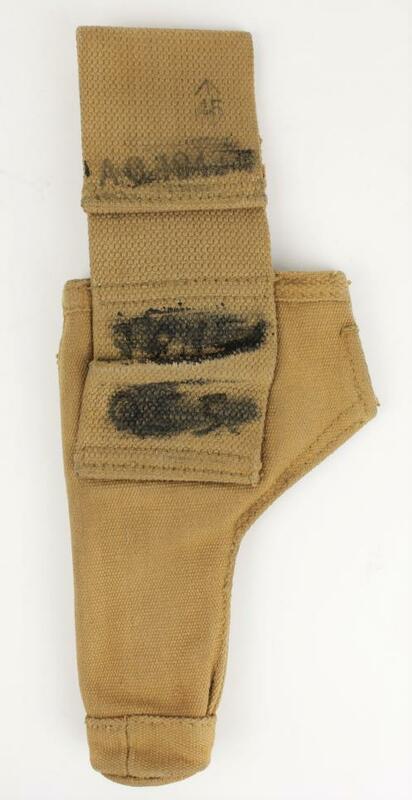 The inside wing detail & right talon 'dot' are not discernible due to wear to the decal. 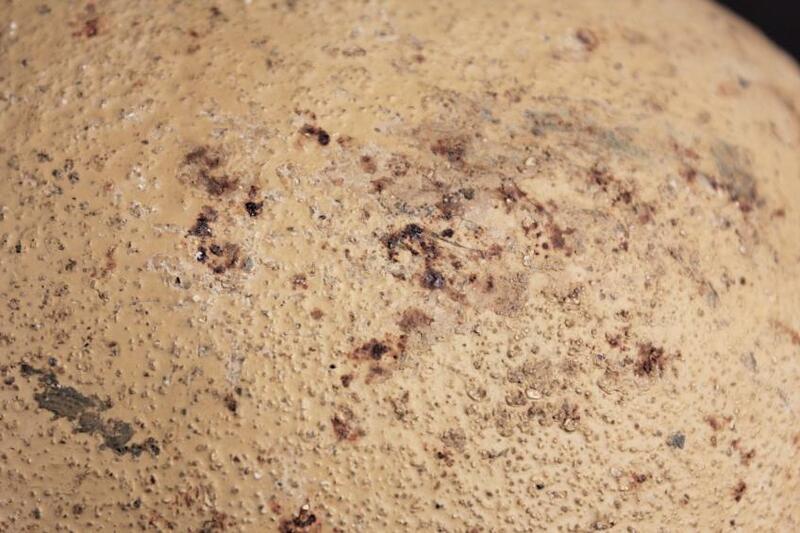 The thick textured sand coloured paint has been applied inside & out & has had sand mixed in with it to execute its granulated effect. 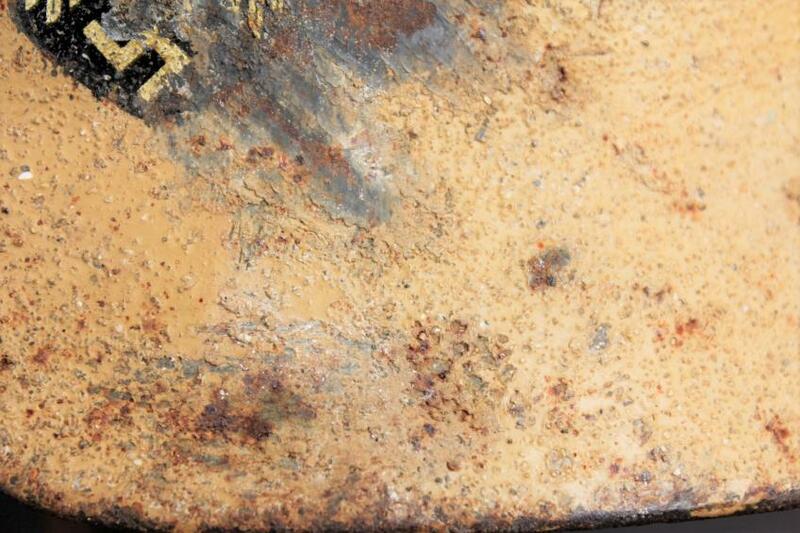 A close examination of the exterior textured paint finish determines the presence of fine sea shell particles within the paint & also establishes the uneven thickness where the thinner areas of the covering have been overbrushed with the sandy yellow to cover the factory green paint underneath. 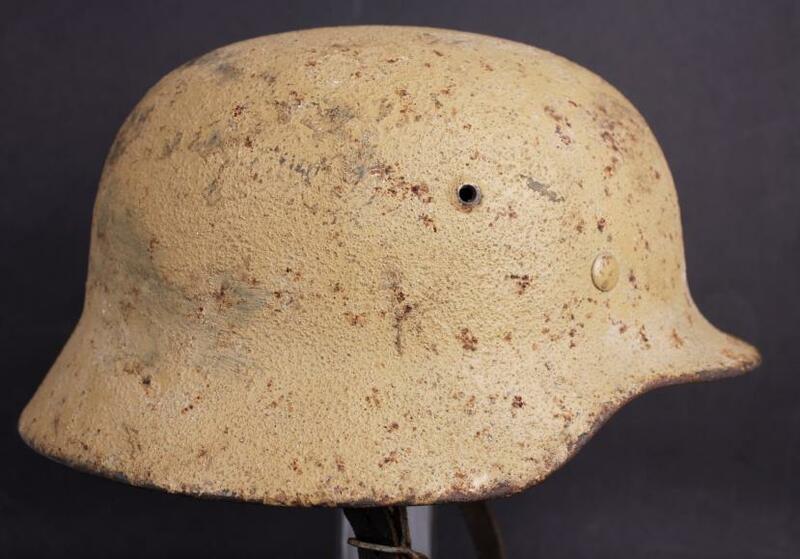 Areas of natural rust bleed are showing through evenly to the exterior of the helmet . 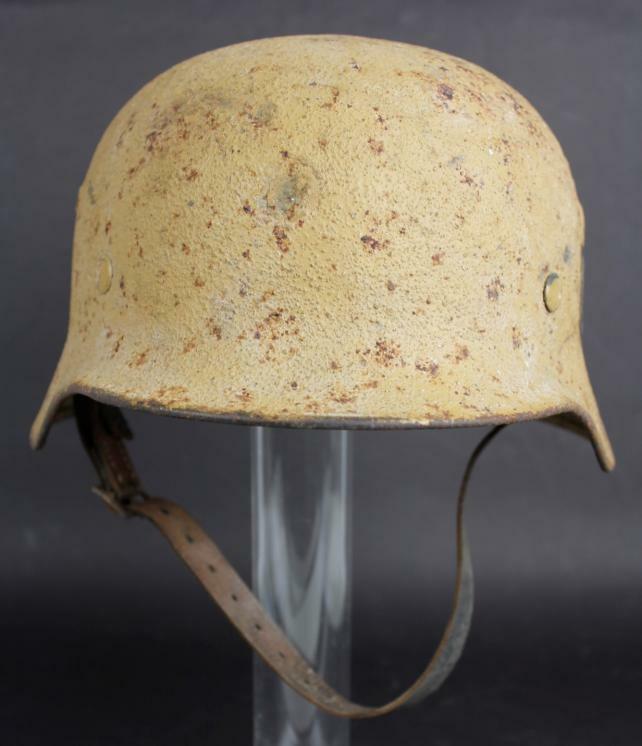 All three liner pins match exactly the sand mixed paint on the rest of the helmet & are 100% undisturbed. 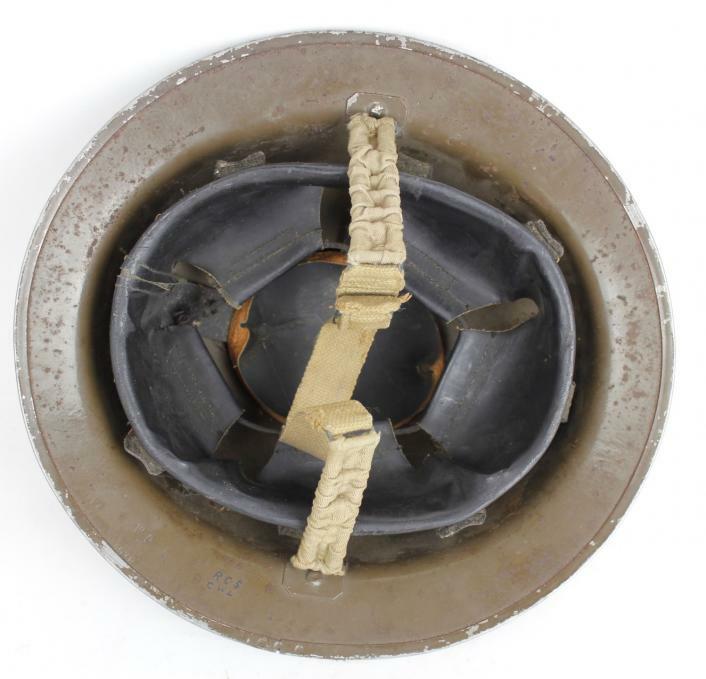 Interior of the helmet has the same sand coloured paint applied around the rim but left smooth without the sand mixed in. 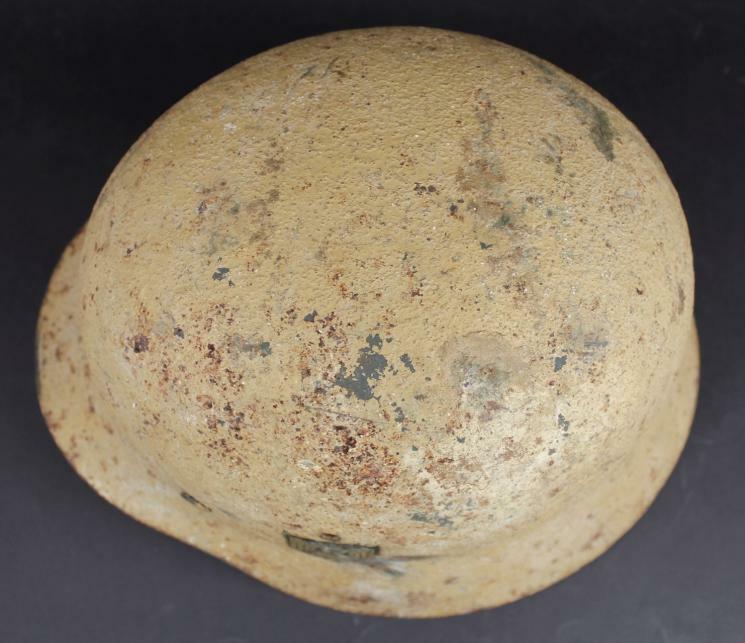 Due to the overpaint it is difficult to see the shell markings however I can just see the maker & size of 'SE68' . 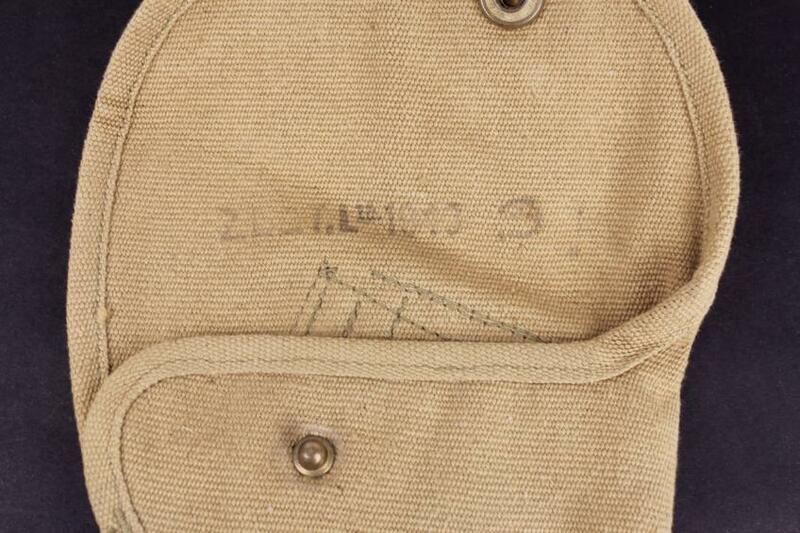 I can only establish the first two of the lot number as '47' , the rest is illegible. 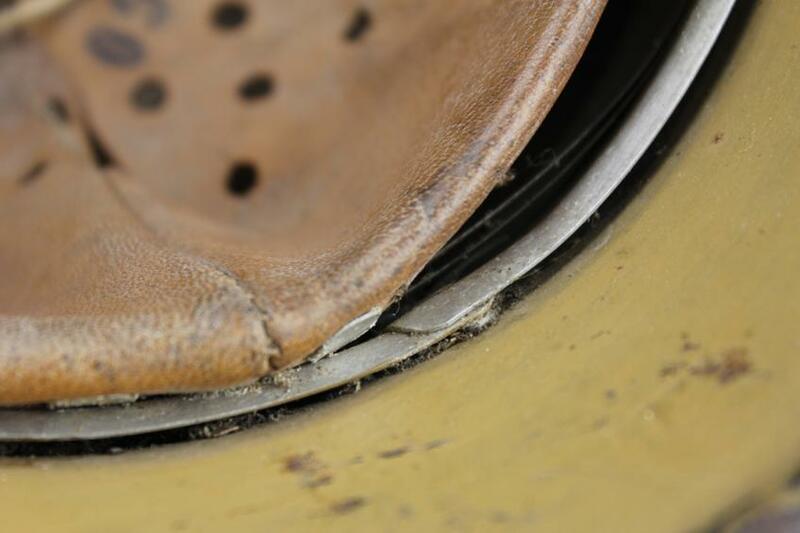 The left underside of the front lip displays thumb wear through the desert paint & down to the factory green from the helmet being taken on & off of the head in the heat. 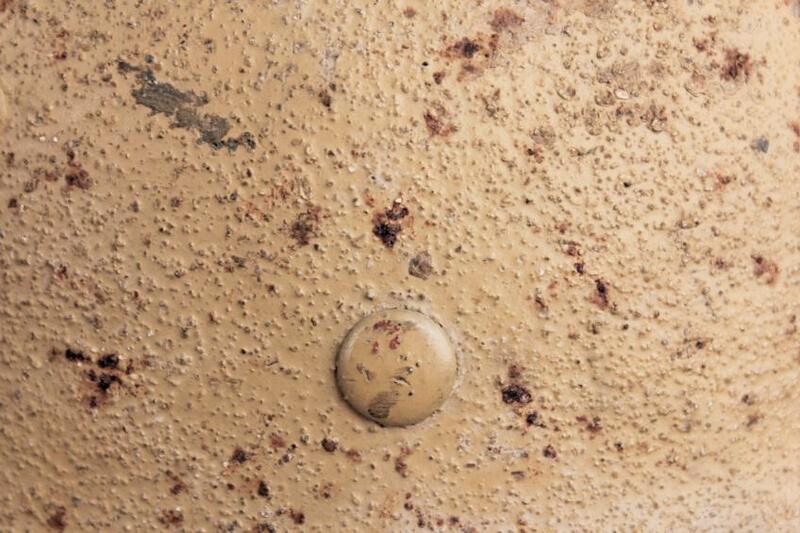 There is also rust bleed around the rim coming through the paint where it was once in damp conditions at some point during postwar storage. 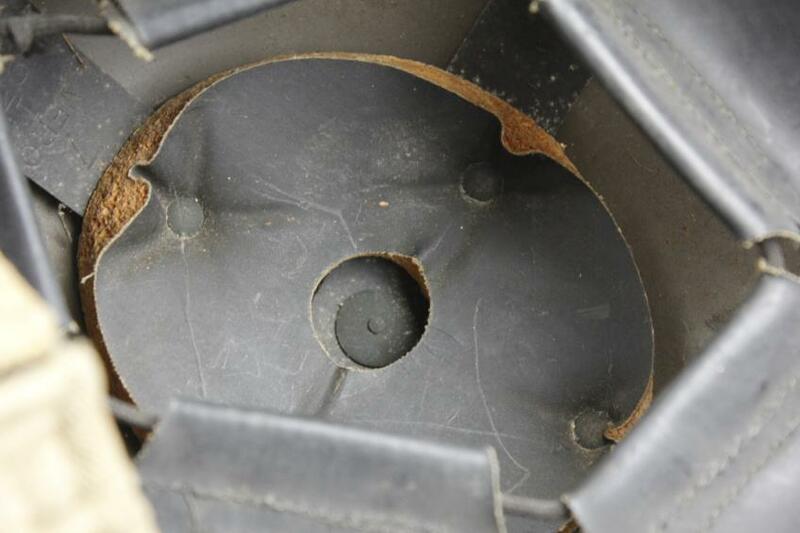 The liner band is of reinforced aluminium with a visual examination ascertaining that it is totally unmolested with a very natural buildup of dust & dirt having gathered between this & the shell. 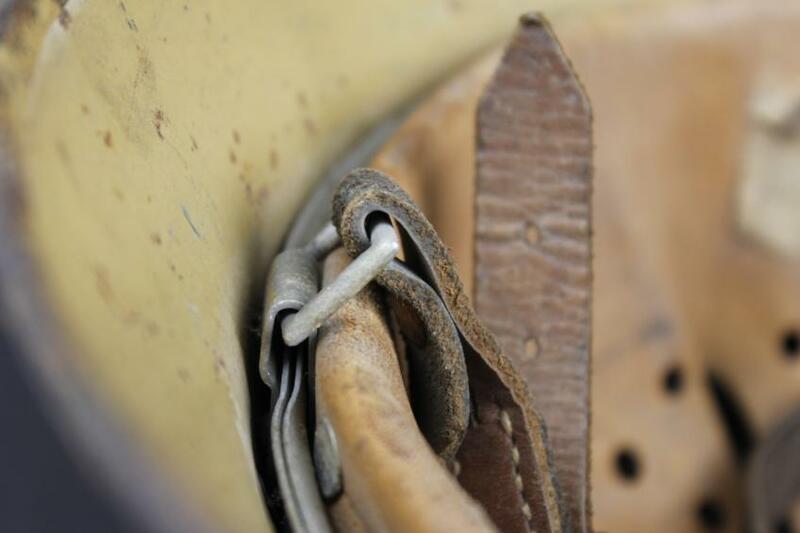 Although the liner itself is tight against the band one can still view the pins arms to see that they are perfectly unbent & undisturbed since they went in during this soldiers service. 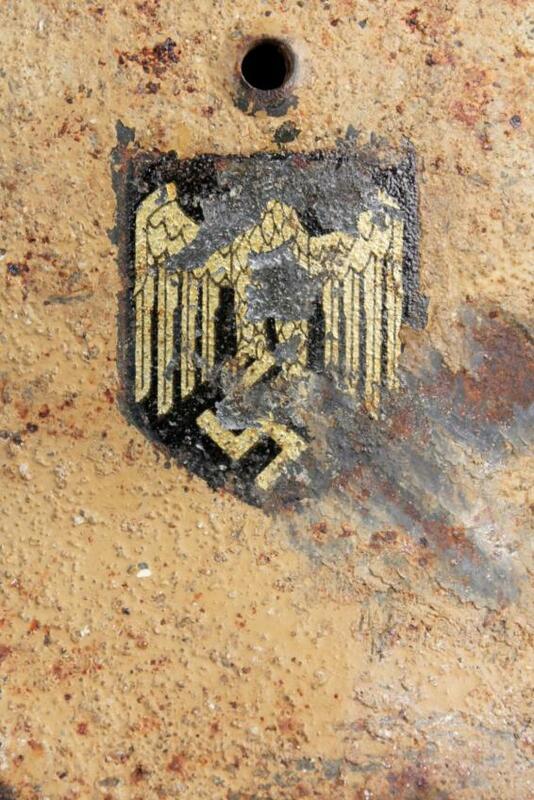 Band has a date of 1940 just about visible. 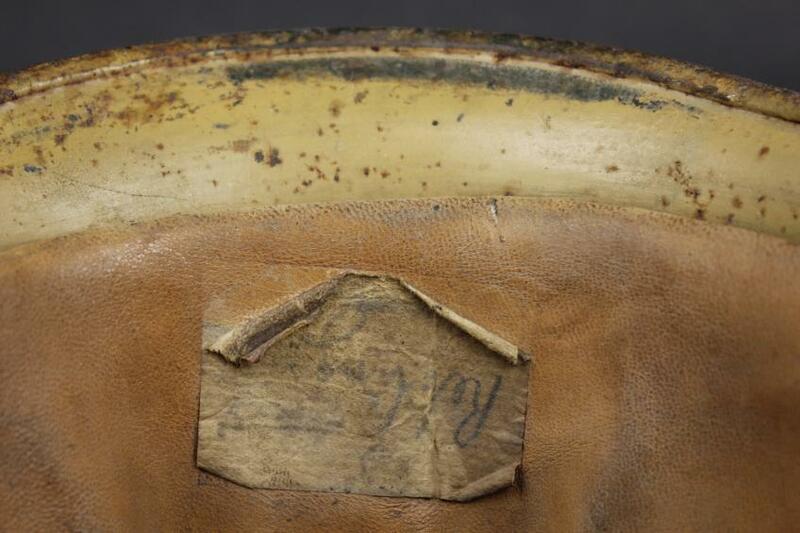 The liner itself shows some wear with a handwritten name of ' M.Rebling' & also a paper label stuck to the forehead area with the same surname being just about legible. 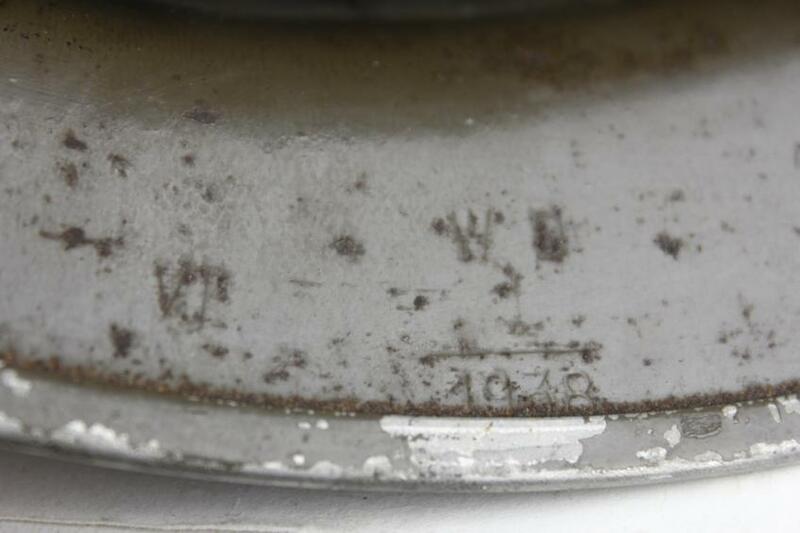 Size of liner is 60. 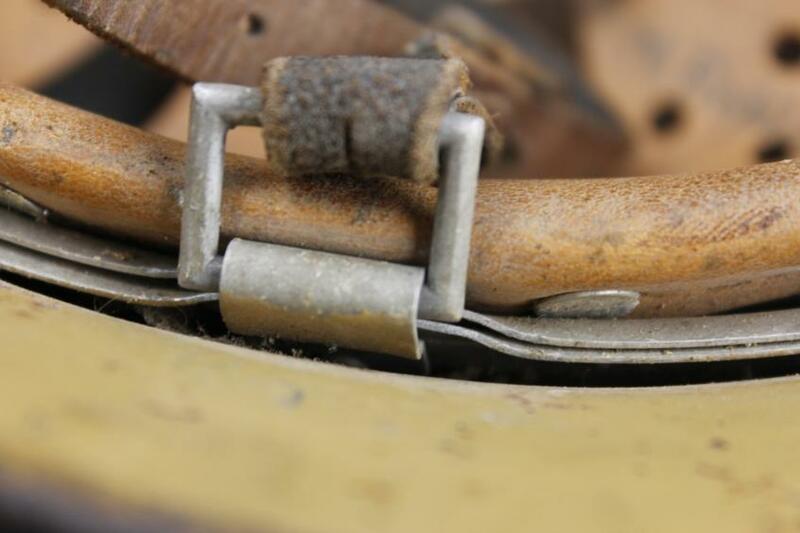 When one views the camouflage paint around the rim it is apparent that there are some traces of the same paint visible on the band . 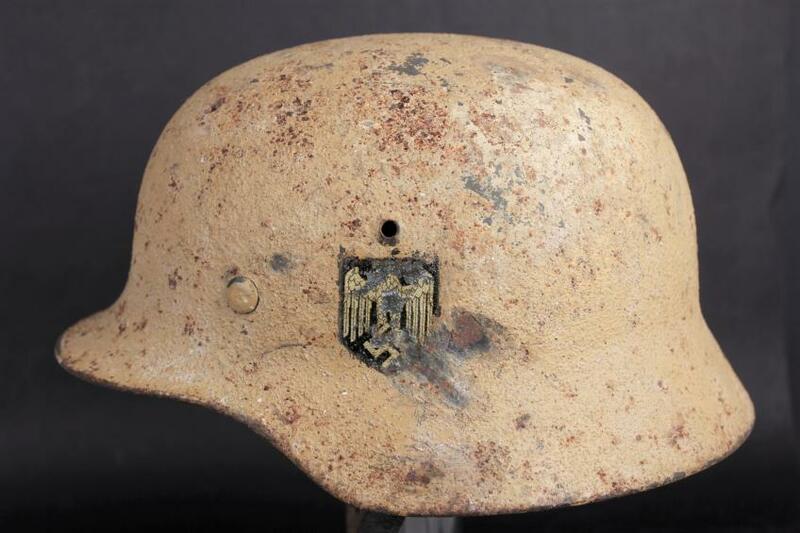 In certain circumstances helmets were camouflage painted in Germany before deployment so this may be the case here. 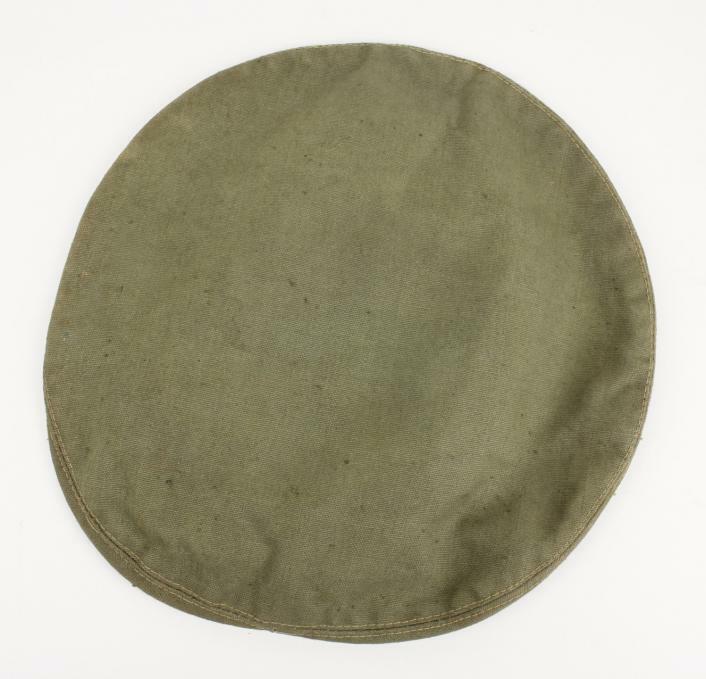 The liner dispays light wear indicating that the helmet was not worn as much as his tropical cap in the heat of the sun , perhaps by an officer . 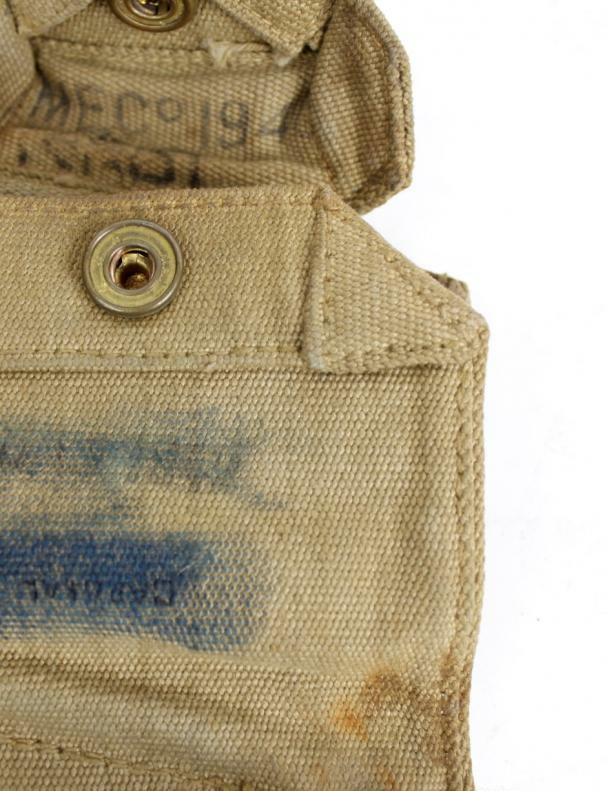 Original drawstring is intact. 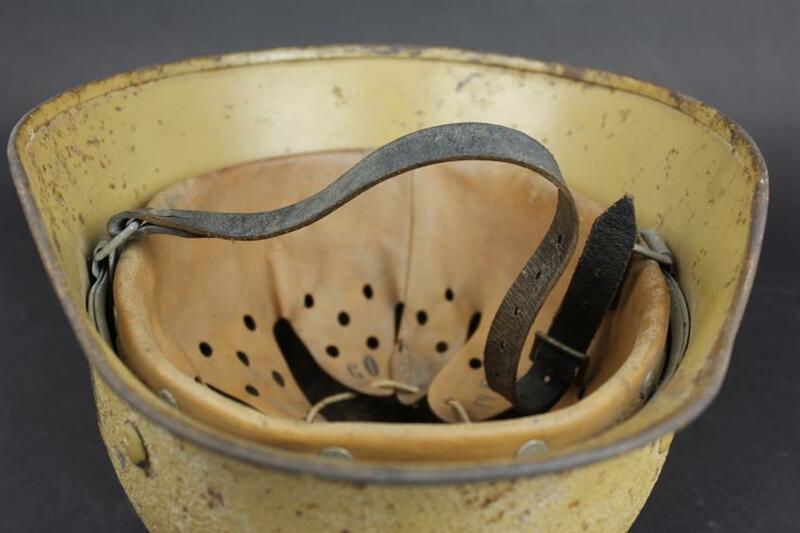 Chinstrap is an unmarked example & is it came still on the helmet. 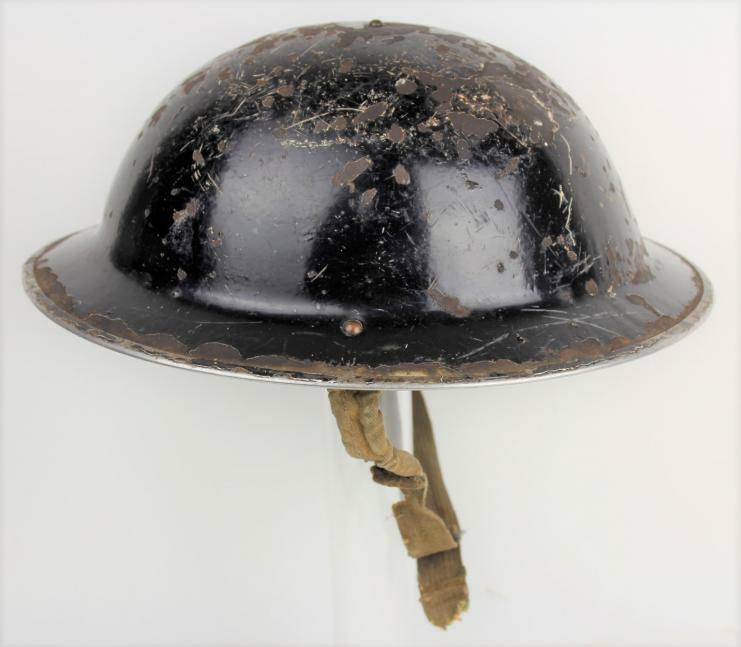 I cannot be sure whether this helmet was taken from North Africa, however I believe we can confidently place it within the North African DAK timeframe of February 1941 - May 1943. 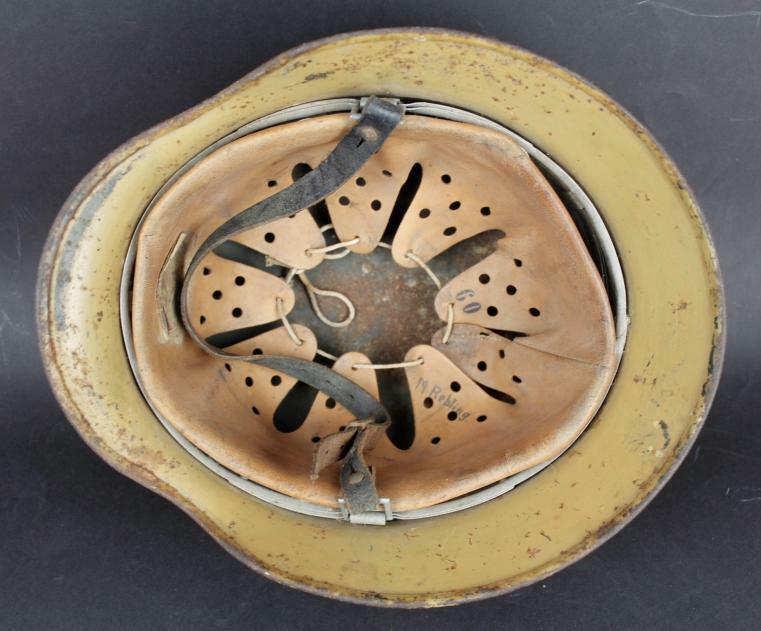 A very rare helmet & one that would no doubt have a fascinating story to tell. 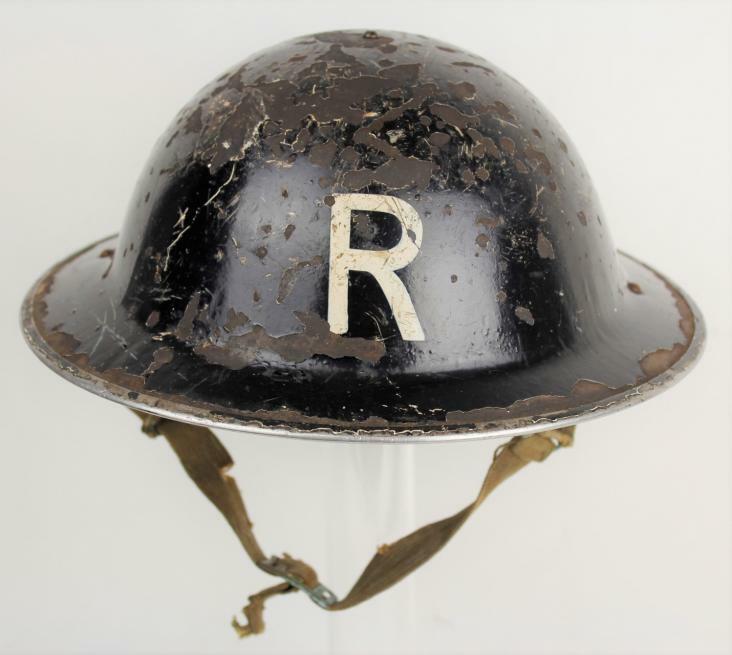 A 1941 dated British home front helmet of the Rescue services with white front & back 'R' initial for 'Rescue' over a black helmet. 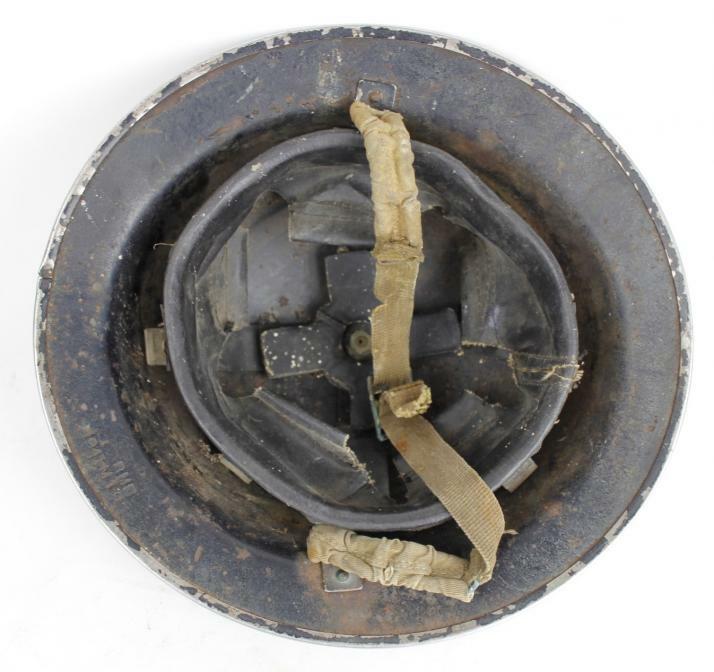 The Rescue personnel did exactly as the name suggests deploying in the aftermath of an Air Raid to rescue civilians from the rubble & debris of the bombings. 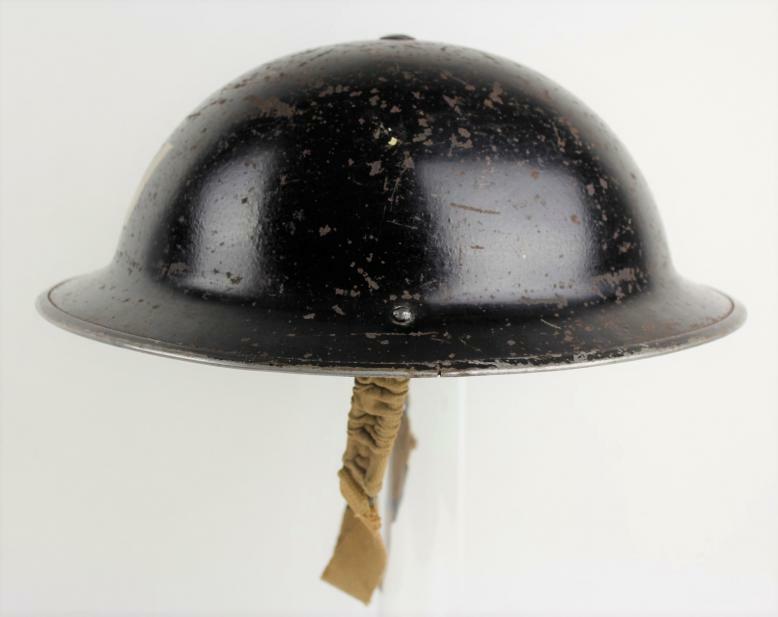 This example came together with the Wardens helmet just listed seperately & displays firm evidence of its heavy wear during war service. 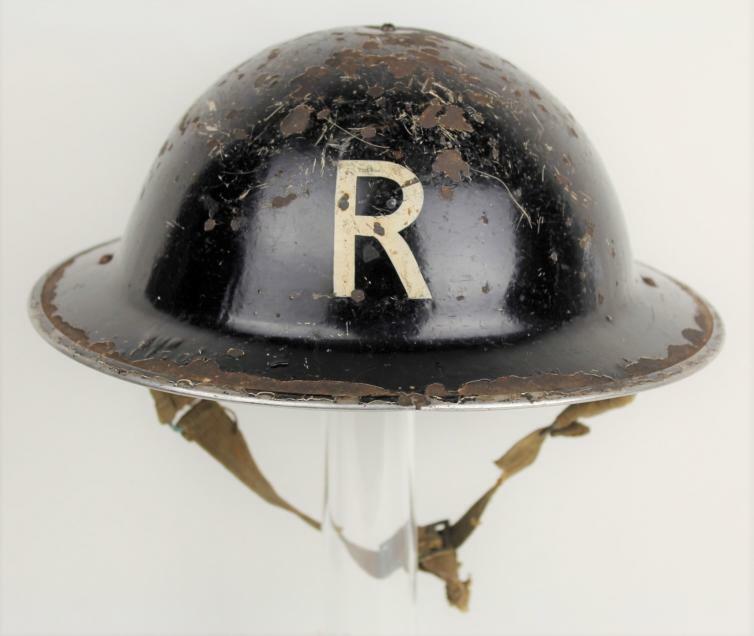 Both of the 'R' initials remain clear with liner & chinstrap still present. 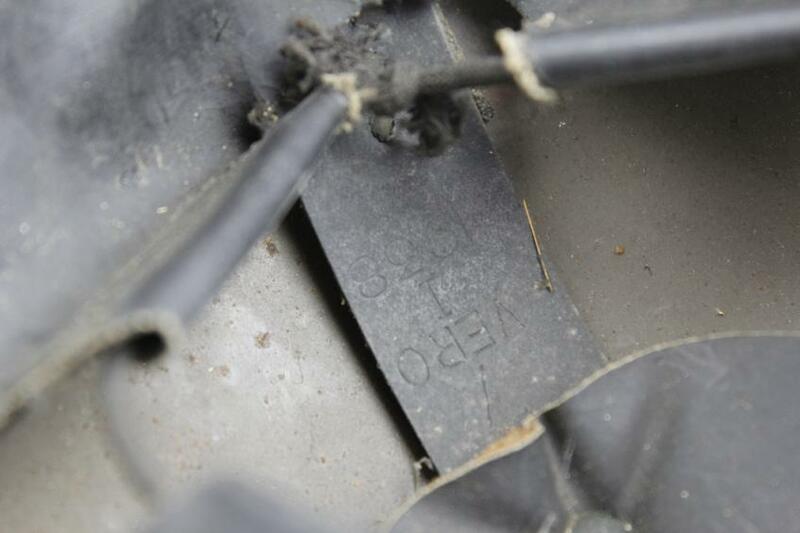 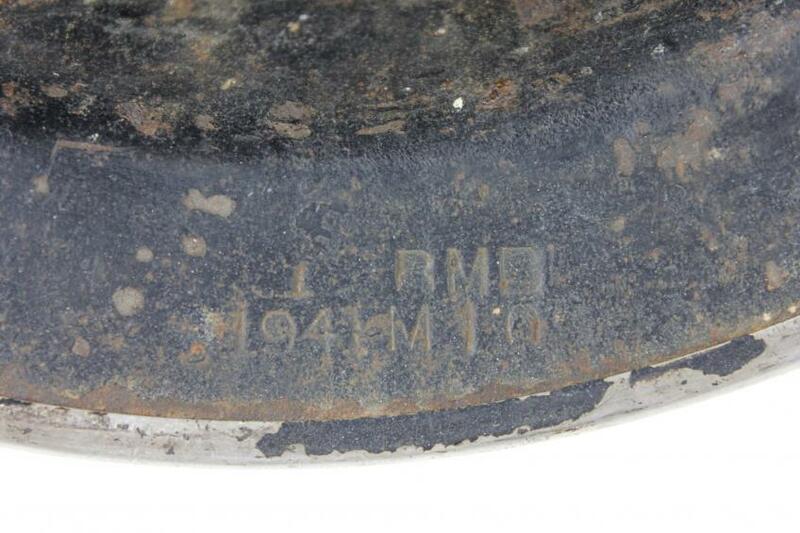 The maker mark of 'BMB 1941' can be seen to rim underside the maker being Briggs Motor Bodies of Birmingham. 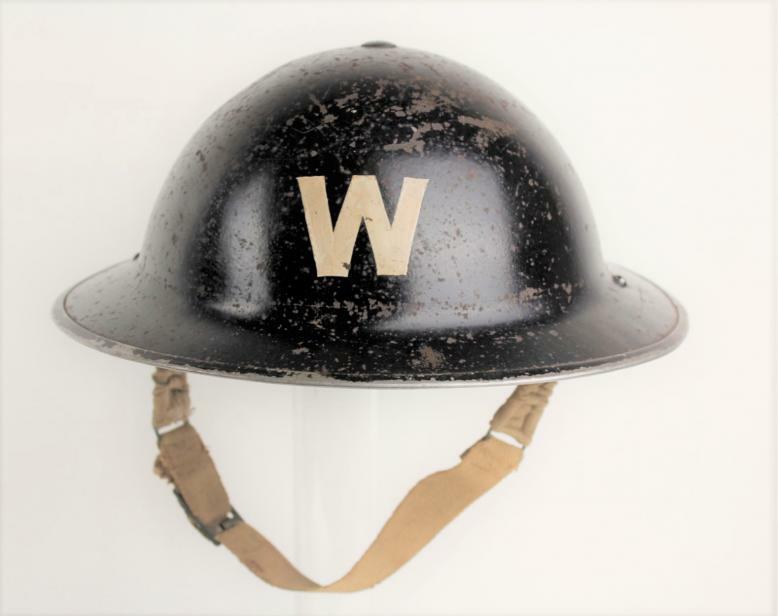 A fabulous example of the Air Raid Wardens helmet this being one of the earliest helmets with all components dated 1938. 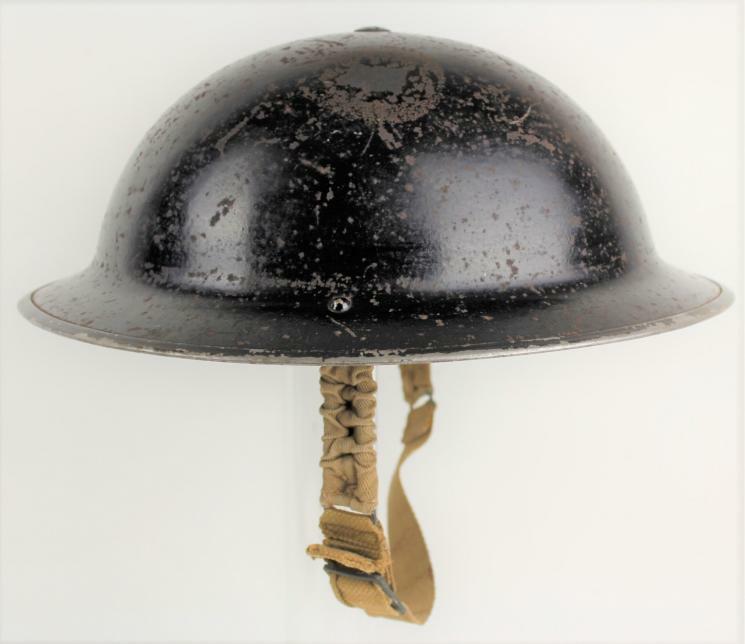 Interestingly the first issues of the MKII helmet did not go to the armed forces but to the Police & Fire services due to a large shortage which needed to be met. 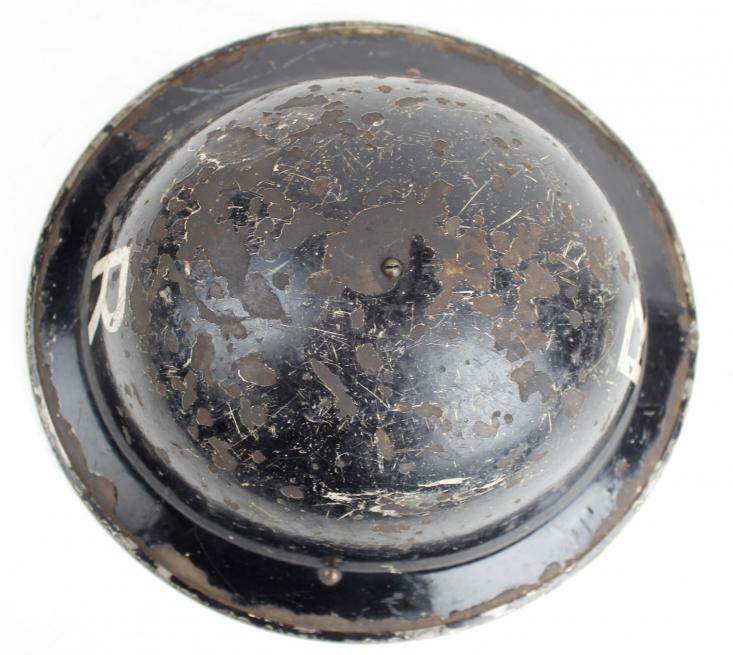 Supplies to the armed forces & Air raid Precautions began to be made in early 1939 with the various colours of each service being painted on at the time of manufacture. 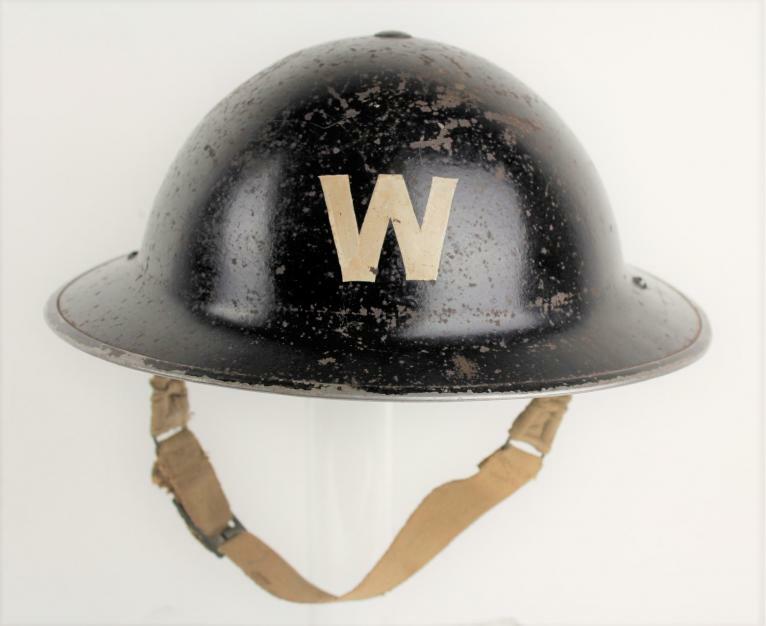 This helmet has the standard khaki finish to the underside of its rim with black to the exterior & a white 'W' to the front. 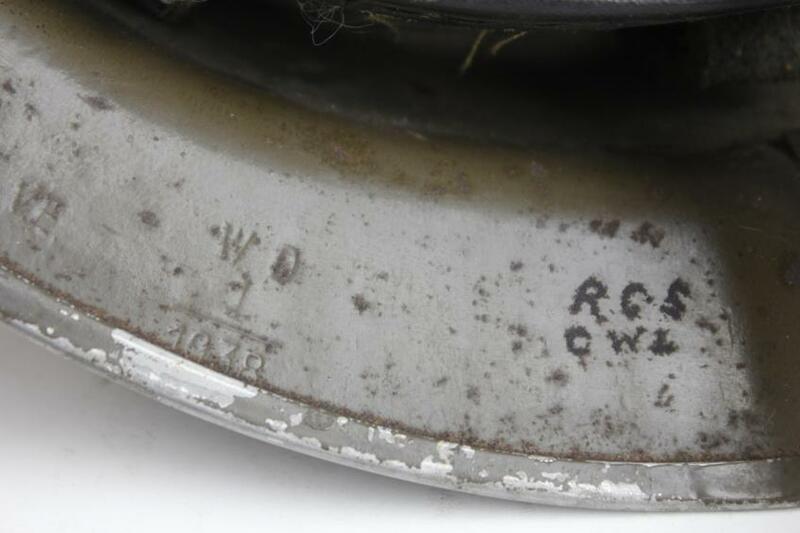 The date 1938 can be seen to the underside of the rim along with the scarce maker initials of 'WD' for the firm William Dobson & Son of Birmingham who only made helmets from 1938-1940. 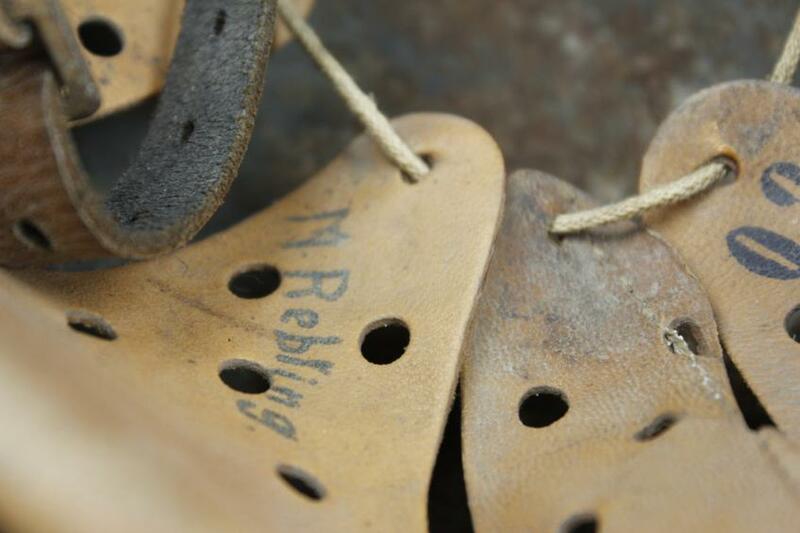 The date 1938 can be seen to chinstrap lugs & also the liner cradle which is VERO marked & a size 7. 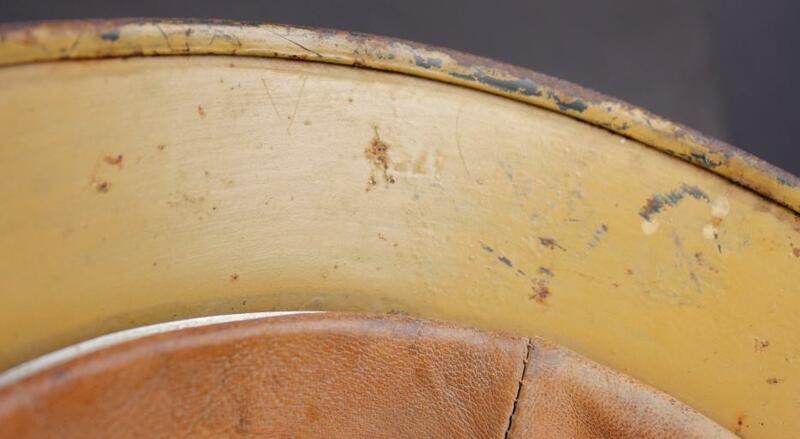 Helmet has early oval pad. 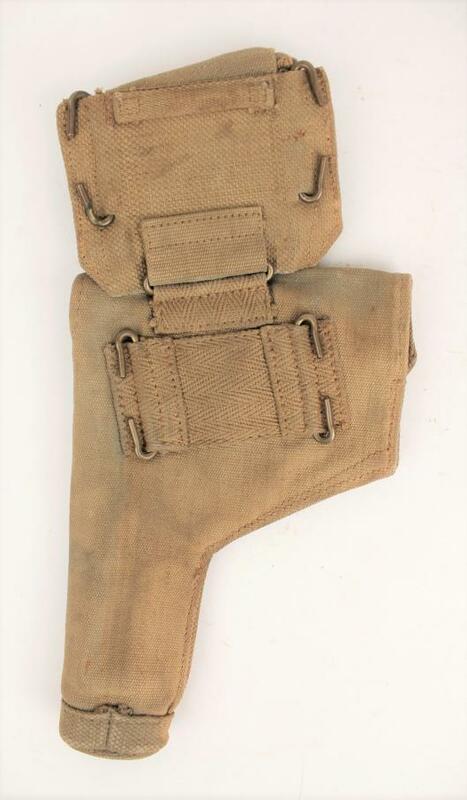 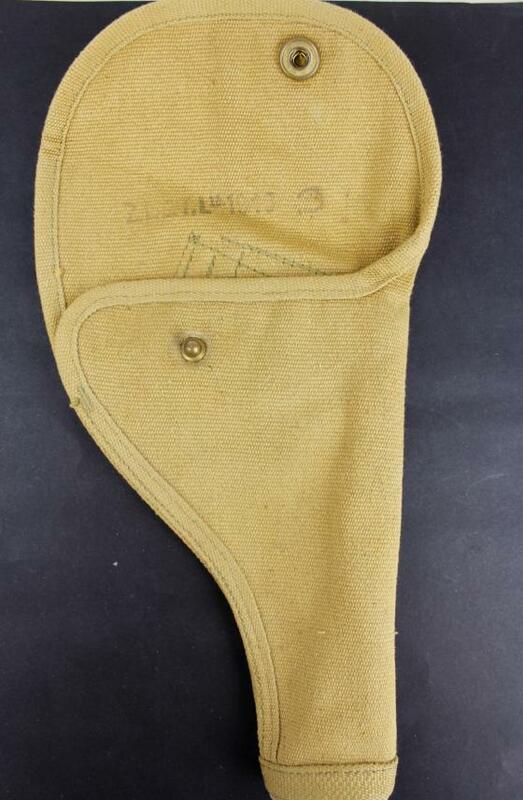 A good used example of the second pattern of tankers holster this being the 'Case,Pistol,Web,RAC, MkII ' . A simply cut down version of the first pattern which was found to be prone to snagging on exiting the vehicle. 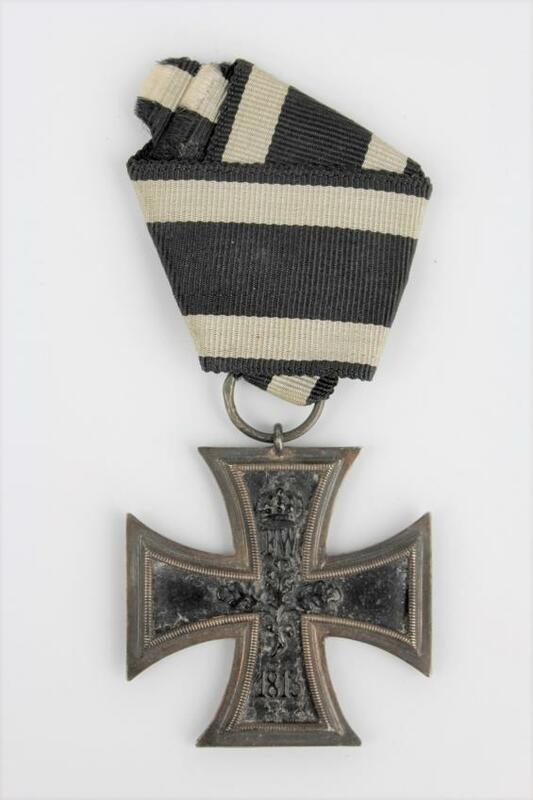 Broad arrow & date 1943 can be seen to reverse, some soldiers markings now illegible. 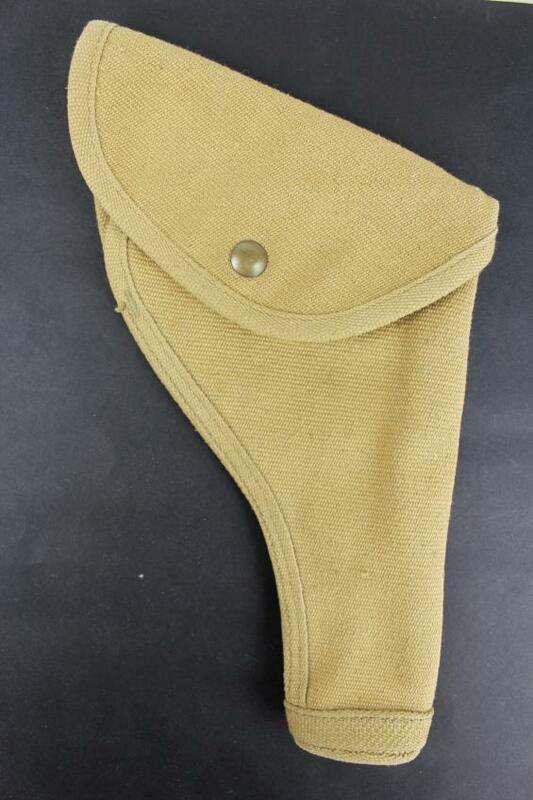 Brass pop stud closure in good undamaged order. 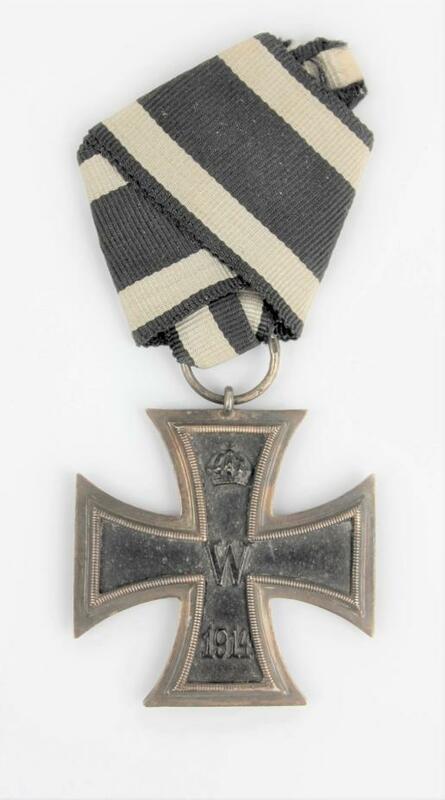 A very good example of the EKII with Austro Hungarian ribbon. 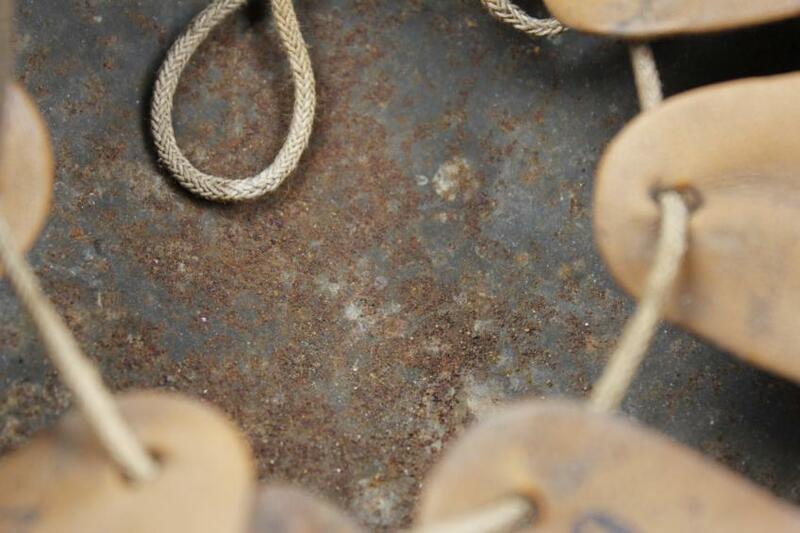 Ring maker marked what appears to be 800. Standard Canadian issue holster for pistols & revolvers this example with Canadian broad arrow within 'C' mark & 1943 date.